Prolific calligrapher Angel Koziupa and designer Alejandro Paul charm us once again with an imaginative typeface. Named after the Afro-Uruguayan drum-based rhythm, Camdombe conveys both a upbeat spirit and youthful joy. Its unique forms dance with each other, complementing their wild, brush-lettered origins. 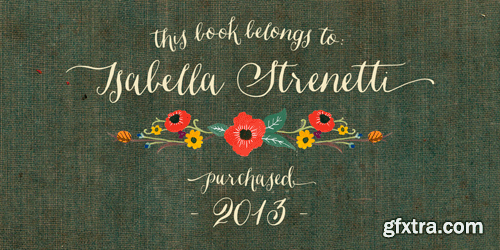 This inherent spontaneity makes it an ideal choice for signage, titles, and greeting cards. The dynamic design duo of Koziupa and Paul strikes again. This time they cover the space from light nonchalance to eerie darkness, and everything in between. Quicker than lightning and just as poignant, Brisa Pro shows unprecedented determination, presence of spirit, and finality of confidence. Brisa Pro is the teenager leaving home, the lover leaving one last note on the refrigerator door, the prophet announcing the imminence of doom, the rebel scratching anger on the wall, the bereaved clawing torment into life, and the bogeyman dropping a line to keep your eyes wide open through the night. Bellissimo Display boasts an impressive range of handsome all caps ligatures that would make even Herb Lubalin jealous. Despite its iconic features, Bellissimo works surprisingly well as a text face as well. 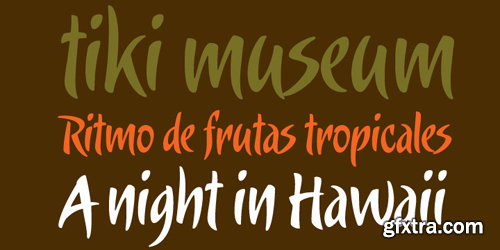 Small capitals, alternate glyphs and both lower and upper case figures are intrinsic in the design. Jan van Krimpen’s famous Lutetia, released at the late 1920s, revived by a complete fresh design..
Trampoline is neat handwriting typeface inspired by requests I'm receiving as designer from people who would like to display dose of human touch in their products and editorials by having an typeface with personality and individuality. William Caslon released his first typefaces in 1722. 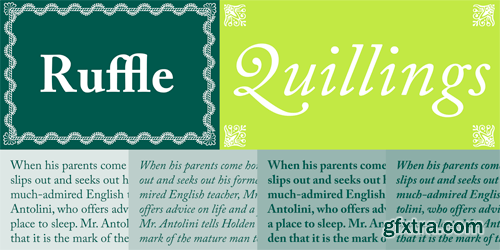 Caslon’s types were based on seventeenth-century Dutch old style designs, which were then used extensively in England. Because of their remarkable practicality, Caslon’s designs met with instant success. Caslon’s types became popular throughout Europe and the American colonies; printer Benjamin Franklin hardly used any other typeface. The first printings of the American Declaration of Independence and the Constitution were set in Caslon. 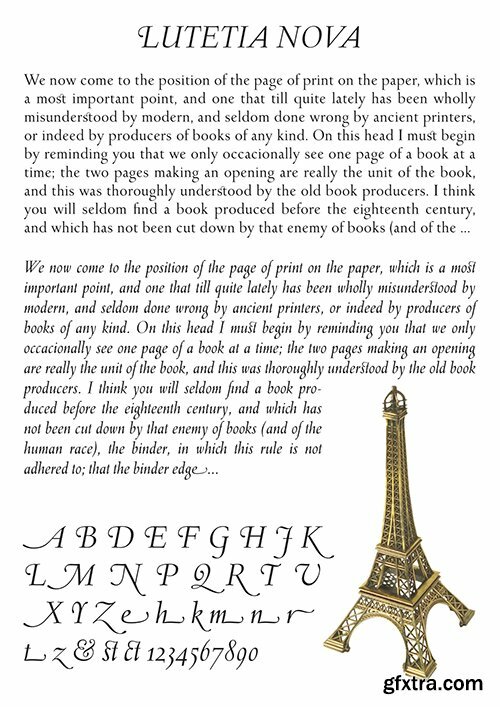 For her Caslon revival, designer Carol Twombly studied specimen pages printed by William Caslon between 1734 and 1770. The OpenType “Pro” version merges formerly separate fonts (expert, swash, small caps, etc. ), and adds both central European language support and several additional ligatures. Ideally suited for text in sizes ranging from 6- to 14-point, Adobe Caslon Pro is the right choice for magazines, journals, book publishing, and corporate communications. Designed by Eric Gill and released by the Monotype Corporation between 1928 and 1930, Gill Sans is based on the typeface Edward Johnston, the innovative British letterer and teacher, designed in 1916 for the signage of the London Underground. Gill’s alphabet is more classical in proportion and contains his signature flared capital R and eyeglass lowercase g. With distinct roots in pen-written letters, Gill Sans is classified as a humanist sans serif, making it very legible and readable in text and display work. The condensed, bold, and display versions are excellent for packaging or posters. F.H.Ernst Schneidler, type designer and teacher, originally designed Schneidler Old Style in 1936 for the Bauer foundry. Stempel Schneidler is based on the typefaces of Venetian printers from the Renaissance period and possesses their grace, beauty, and classical proportions. 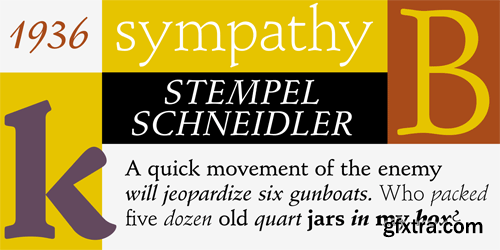 Stempel Schneidler is a fine, legible text type that also works well in display. One of Schneidler’s more unique features is its question marks. Developed for Volkswagen AG in 1979, VAG Rounded is a variation on nineteenth-century grotesque sans serif designs. What is unusual about VAG Rounded is that the terminal of every stroke is rounded. 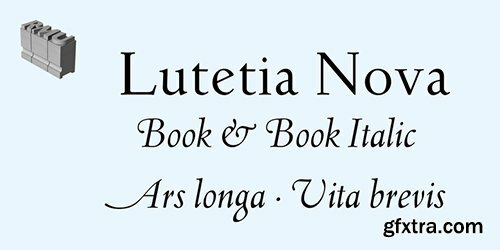 Alfina is a chancery typeface that shows a modern temperament, but is inspired by the eponymous town of Torre Alfina, one of the most beautiful medieval villages of Italy, situated on the edge of the plateau Alfina, a few miles from of Orvieto. The place where is the castle is steeped in history. Its roots date back to the Lombard kingdom (seventh century); later it was under the rule of Monaldeschi (1200-1700) and more recently (1880) the property of the rich French banker Count Edoardo Cahen of Antwerp, who was responsible for the present aspect of the Castle. Alfina has soft lines, very slender upper cases and thin overlapping strokes; The stylistic alternates are particularly important, and the type is enriched by many, different OpenType features. Aubaine (2012), the youngest typeface by designer Jean Paul Beumer, is to be seen as the elegant and graceful grandniece of the more modernist and business minded gentleman Helvetica who was born in 1957 in Switzerland and who is himself a descendant of the erratic “Baron Akzidenz Grotesk” (1896) – said to be the first widely used sans serif. 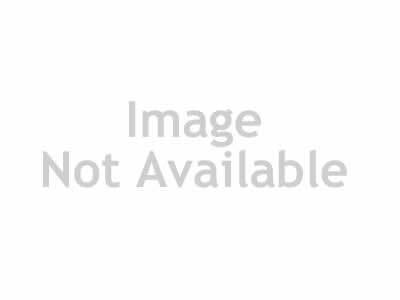 This unsurpassed Aubaine is literally and figuratively a blessing in type territory, finally a girl that is really going to make it! Aubaine is assuredly a pleasant addition to the more upscale branch of the family of sans serifs. 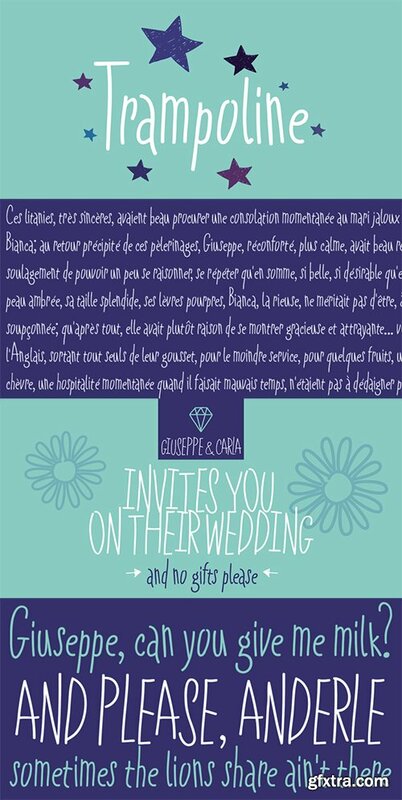 Aubaine therefore offers a variety of light weights and is characterized by round, smooth shapes and a large x-height. 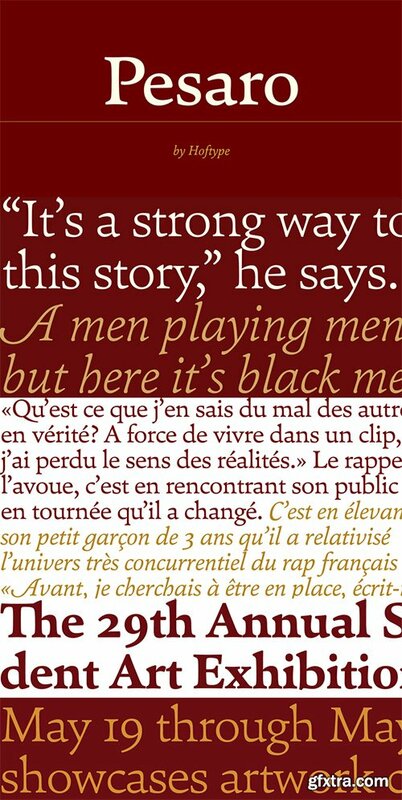 Also in small sizes Aubaine remains a friendly font with bright open counters. Excellent for use on sound aesthetic packaging of all kinds of desirable wellness and design products – including the “sweet” small print. Arcus OpenType is a geometrically constructed font. The grounding principle is the round curve. The homogeneous character of this font is guaranteed by using this principle not only in drawings of particular letters but in the shaping of diacritical signs, too. The scope of the typeface weight is from Extra Light to Extra Bold while the complete font family includes 6 weights and their respective, well turned italics. This font contains a wide range of alternative signs, small capitals, lining and oldstyle numerals, fractions, superiors, inferiors, ligatures and discretionary ligatures; all this is within the frame of OpenType functions. This font type is not made for the typography of extensive texts. Best it can be used for headline display typeface or in creating logotypes and corporate identities. 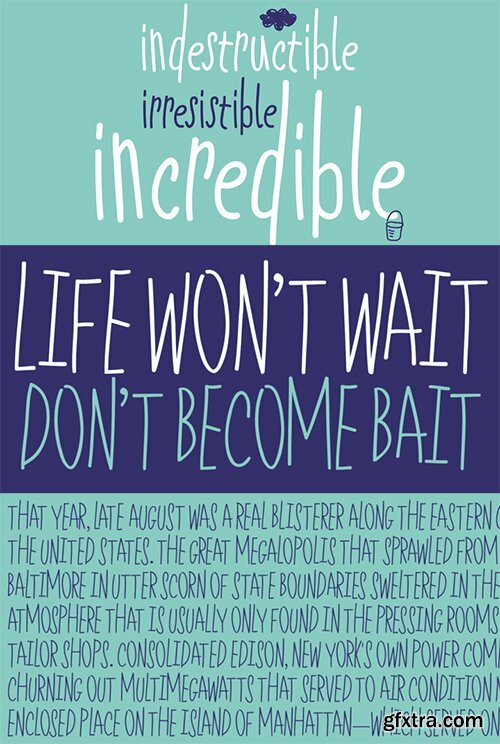 Delicious Pro from Yes Please is a bold, contemporary take on the classic Americana script. Inspired by the vibrant history of early 20th Century American packaging vernaculars, Delicious Pro delivers unique flavor packed with gestural personality perfect for headlines, packaging and more! Delicious Pro features conventional ligatures, a standard set of accents and symbols, and a full set of extended custom styling ligatures to provide a versatile end-user experience. Delicious Pro has played hard for Nike Women’s Training, Nike Sportswear, IFC and more. Delicious Pro is designed by Lee Schulz. 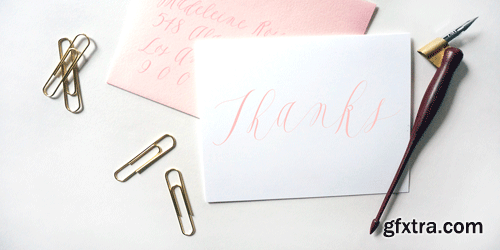 Ondise is a curvy and warm hand-lettered calligraphy script with a natural, dancing baseline. This Opentype font was created with a pointed pen & ink, and includes six different ampersands as well as a swash feature that automatically substitutes beginning & end of word letters. To enable alternate ampersands, simply turn on the contextual alternates feature and type &1, &2, &3, etc. Opentype coding automatically substitutes the new ‘and’. 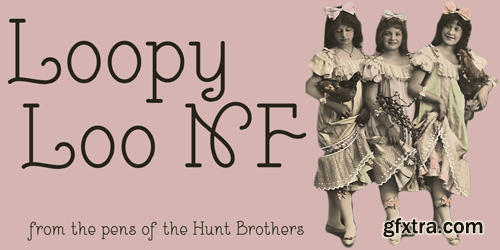 The Hunt Brothers, penmen extraordinaire, presented the pattern for this face as Upright Ornamental, it’s a little loopy and a whole lotta fun. Both versions of this font support the Latin 1252, Central European 1250, Turkish 1254 and Baltic 1257 codepages. Typeface Little Cecily was designed on the base of Russian calligraphy sample book for primary schools “Propisi pryamogo pis’ma” (Moscow, 1914). Such kind of scripts was implemented in school programs at the end of 19th — beginning of 20th century. There was an opinion that the straight writing is easier for learning and better for children from a medical point of view. The letterforms of the typeface are characterized by simplified constructions and upright design which distinguishes it from the list of typical school scripts and convey to it a naive charm and originality. The character set covers standard Western and Cyrillic code pages and contains some additional letters from the old Russian orthography. Besides it includes alternative letters that were presented in original book and contextual forms for connected writing. The font was designed by Olga Umpeleva. Released by ParaType in 2011. 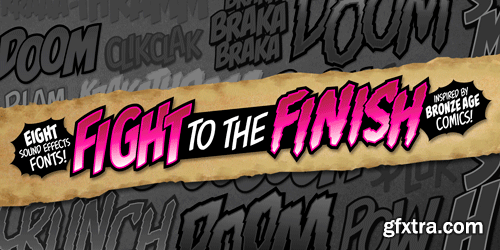 Inspired by the Bronze Age of comics, “Fight to the Finish BB” comes with EIGHT sound effects fonts; four with clean edges, and four with rough edges. Talk about covering all the bases. All have extended European character sets, as always! 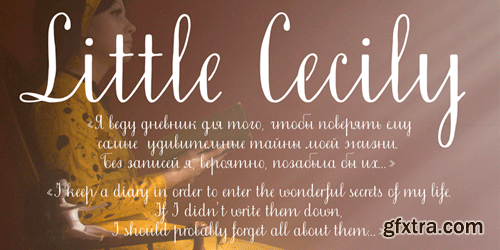 Feast is a calligraphy style font designed by Alissa Mazzenga. Her hand-sculpted letterforms emanate a powerful, yet delicate presence. Their magic resides in the ethereal movement of fluid wisps of ink, forming soft arched lines and design that stands alone. This hand written style font is based on Alissa’s signature calligraphy style and pairs beautifully with fonts like Frosted and Icing. Montague Script takes its name from a small hilltown of western Massachusetts rich in culture and history. I lived in this beloved community for a number of years and it’s where I first began my study of calligraphy and lettering. While most brush scripts take their cue from mid-twentieth century samples, Montague Script is a fresh, contemporary alternative. It comes directly from lettering written with a #3 sable brush on smooth vellum and is digitized with the same sensibility a lettering artist writes with. 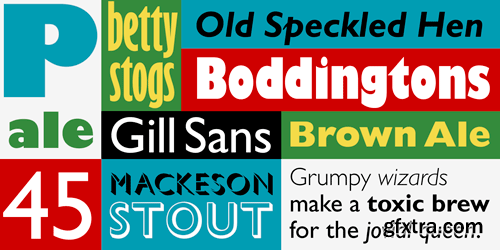 Montague reflects a dynamic interplay between form and rhythm not usually associated with type. Words suggest a baseline, yet are not bound by it. Beginnings, endings, alternates and ligatures come in as needed while you type. 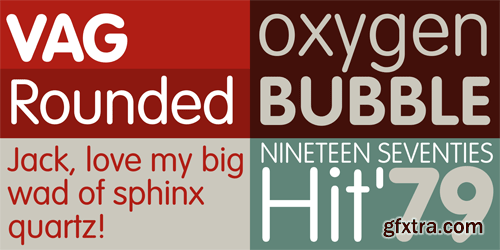 Many more alternates are available in the glyph palette of most current graphic software. Exuberant swash versions of upper and lowercase letters, as well as ligatures can be accessed through both the type and glyph palettes. Montague Script is a natural for advertising, point of purchase displays, packaging and logo design, cards, invitations, journals and much more. You will be delighted at how well it can dress up a project and how easily it sets. 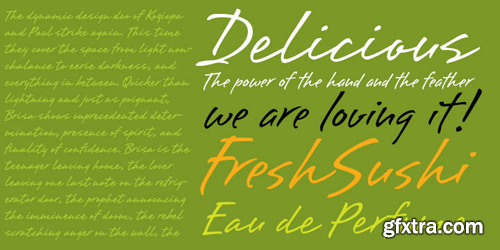 Pesaro is a new text typeface with a strikingly robust but charming appearance. Inspired by early prints from Venice like Jensen and Manutius, it follows its own formal concept of a contemporary design – a stable typeface with strong text qualities and graphic appeal.The Pesaro family comprised 12 styles and is well suited for ambitious typography. It comes in OpenType format with extended language support. 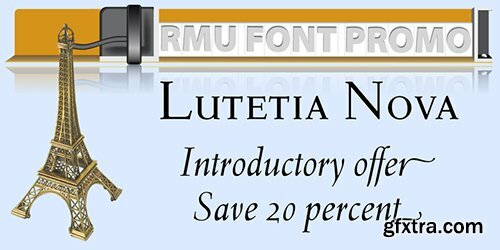 All weights contain ligatures, proportional lining figures, tabular lining figures, proportional old style figures, lining old style figures, matching currency symbols, fraction- and scientific numerals and elegant swash captitals for all italic styles. An attempt to go back towards the beauty of fine book printing, inspired in Britain’s literary classics.Athelas takes full advantage of the typographic silence, that white space in the margins, between the columns, the lines, the words, the lettershapes and finally, within the characters themselves. It is also intended to take advantage of the great advances and technical developments made in offset printing.Athelas shows its best side in finely crafted book editions and good printing conditions. Athelas has a large character set that covers most of the languages that use the Latin script. 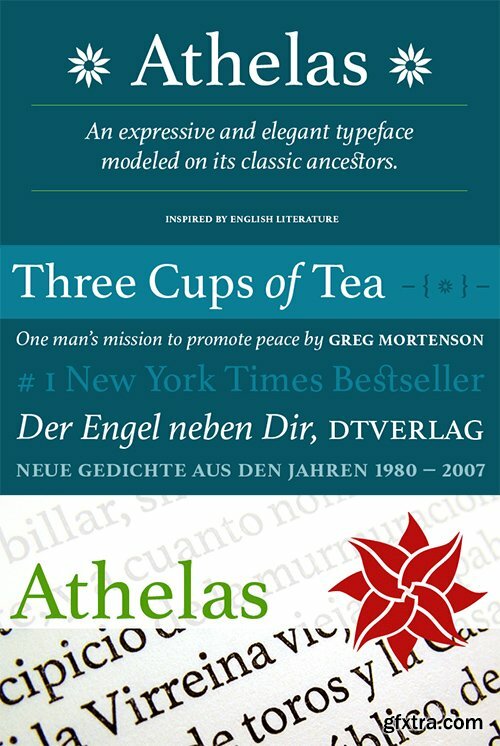 Although inspired in British literature, this typeface respects the cultural values behind different languages, where diacritic marks have an utterly important role.Athelas features four weights and about 800 characters per weight, including small caps, discretionary ligatures, fractions, a complete range of numerals for every use and a set of ornaments and arrows. 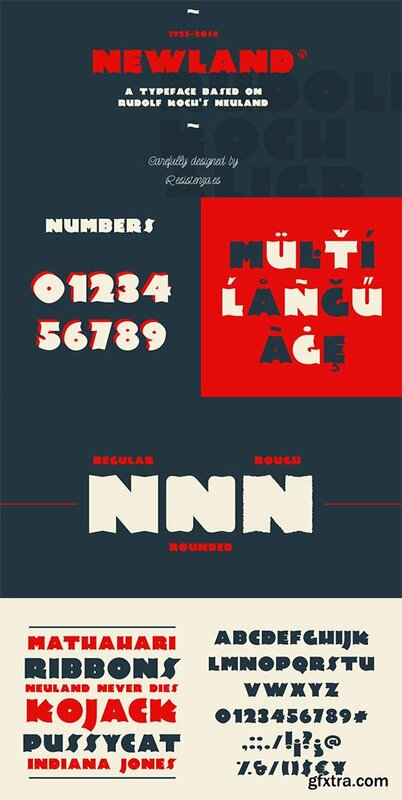 Newland is a blocky typeface inspired by Rudolf Koch’s calligraphic Neuland. MonsterHand is our first Ruling Pen made face. This tool is usually used in calligraphy for expressive lettering. Giuseppe Salerno’s hand has been converted into this crazy typeface. This font includes also a set of icons. Enjoy it!